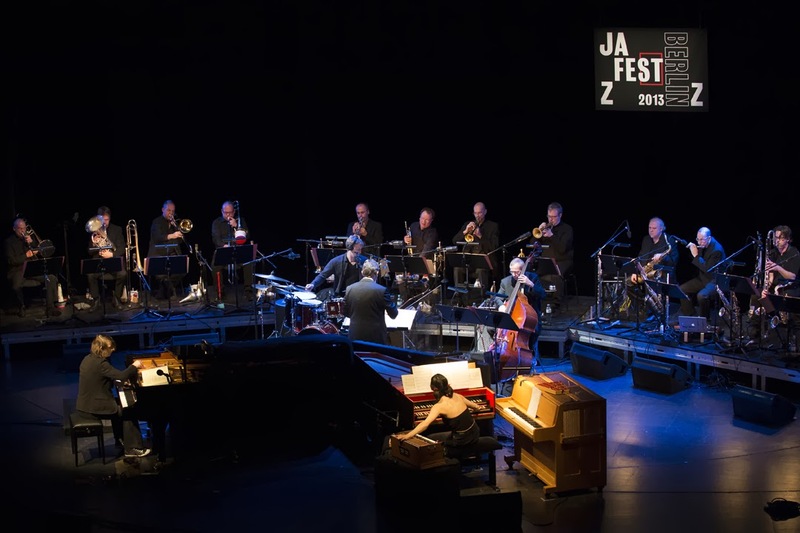 The themes of the 2013 Berlin Jazz Fest spanned far and wide. They took in not just different continents - from Africa to Europe and then onwards to America – they also bridged epochs of history, going back to a time before jazz existed, through its great period, and reaching right up to the present day. That sense of an over-arching context made the BerlinJazz Fest 2013 something very special, a festival in which the individual programme constituents appeared to catch the light off each other and to reflect it back. It was as if the different elements might spark off each other, and produce energy. This is the second Berlin festival with Bert Noglik in charge. He is without doubt one of the most persuasive and sensitive jazz advocates in Germany. He made the point that he sees the festival not so much as an exercise in attracting famous names and glamorous stars (although there were quite a few among the twenty-two acts in the festival). So, rather than producing a superficial veneer of stardom, what Noglik has achieved is to give the festival its own, extremely musical identity, through subtle connections between the various programme elements. His achievement does indeed make the Berlin Jazz Festival stand out from the pack, and make it a lot more than just a parade of big names. The launch event on the opening Wednesday included a film, a panel discussion and a concert by the German-Malian Trio Ivoire. Their appearance introduced an African theme to the festival programme. The following day, the festival put down a few more markers: New Orleans-born trumpeter Christian Scott is the kind of musician whom perhaps only the birthplace of jazz itself could have produced. He is a virtuoso at the peak of his game, powerful and earthy, right in the groove, yet clear, and at the same time both an entertainer and an intellectual. He is an heir to Buddy Bolden, completely hip to the beats and sounds of contemporary pop, but also fully aware of and inspired by his forefathers' passion. He portrays the experience of insidious everyday racism, as seen from the perspective of a thirty -year-old African-American, through music full of vigour and freshness, elegance and anger. His sextet was formed several years ago at Berklee College in Boston. These players, rooted in the formally taught chord-scale lexicon, skittered up and down the octaves, but it was their guest, a musician from another era, who enabled them to step into a different and better light: the soprano saxophonist Richard Howell is some thirty years older than Scott, and is far too little-known. He is a musician who developed his focused sound alongside such players such as Jimmy Smith, Cecil Taylor and Don Cherry. His unruffled manner, his clarity of melodic line and thought brought the hustle and bustle of the younger men into perspective. You have to see the encounter of old and young together to register what is lacking from technical accomplishment on its own. This was a meeting that made the rings in the tree-trunk of jazz visible, serving as a reminder of what is missing from young wood. The next project, Joachim Kühn's Gnawa Jazz Voodoo dug down several ages deeper among the root systems of jazz, and had been specially put together for the festival. The pianist was born in Leipzig in the former East Germany in 1944. Among German musicians, he is probably the one who best serves as a living embodiment of the international nature of jazz at its most radical. Kühn grew up in the city from which Johann Sebastian Bach influenced the world, Leipzig. His youth was spent in the shadow of his brother, fourteen years older than him, who had already achieved international renown as a jazz clarinettist, Rolf Kühn. Joachim Kühn developed a fearsome instrumental technique and vocabulary, on which the major players of European classical music as well as the jazz piano masters have left their mark. He now lives on the Mediterranean island of Ibiza. His German /Spanish/Moroccan trio is alive to the cultural cross-currents of the Mediterranean, notably the influence of Gnawa musicians, whose ancestors once came to Morocco from West Africa. 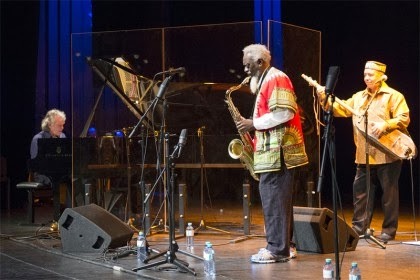 For the Berlin concert, Kühn had augmented his trio with Gnawa musicians: three percussionists from different regions of North and West Africa. He also welcomed Pharoah Sanders. Sanders earned the status of a true jazz legend working alongside John Coltrane on the album Ascension in the sixties, and still takes the listener on anthemic flights, ascending into the stratosphere. So what do you get when the representatives of such different traditions meet? What happens when a secret inheritor of Bach meets not just the executor of Coltrane's will, but also the keepers of the African flame? A party, a neighbourhood party of dance and trance of rhythm and groove, which is also breathes the energy for an impressive and exuberant dance routine, in which Sanders was carried along. But he did seem out of his element. He wasn't quite up to the seething energy of music, with Kühn just getting on with it at the piano, taking the music off in its own directions. At the age of 74, Sanders now lacks the physical presence or the strength of sound on to allow the wings of melody to take him into the stratosphere of expression, territory which was once very much his. It sounds like a farewell: one of the truly greats cannot now match up to such high expectations. The following evening "Wunderkammer XXL" gave us a sturdy bridge to the European past. This is a project in which the interaction between the German pianist Michael Wollny and the Israeli harpsichordist Tamar Halperin, with the big band of Hessischer Rundfunk providing a magical world of timbres and textures. Even the combined sound of the piano and its predecessor the harpsichord was a tonal adventure which Wollny and Halperin cleverly savoured. The sound of the two instruments combined seamlessly, the piano tone acquiring angularity, lengthening its reverberation, the two combined in constantly varied and interesting sounds. But the weight of the HR Big Band, with combinations of flute and saxophone variants brought an additional palette into play, summoning up a cosmic variety of tonal colour. Alongside the inventiveness of such projects, truly contemporary and yet in a creatively tense relationship with the roots of jazz, some of the headliners' contributions fell short of the mark: the Klezmer Funk of Abraham Inc, a large ensemble based around the trombonist Fred Wesley and clarinettist David Krakauer, for example, however remained monochrome, as did the band formed by Jack DeJohnette with clarinetist Don Byron. These are all-rounders, capable musicians who know what they're doing. They traverse different time signatures and time-feels with an instinctive sureness, they can develop a common pulse, dazzle with sheer class, but don't connect beyond the stage. One glance at the clock and it becomes clear that this is a business, and not about making the music relate to the people in the audience. What fails to happen is that they don't create the voltage ratios between their own musical history and ours, and it simply doesn't lead to an experience which can transcend the moment. 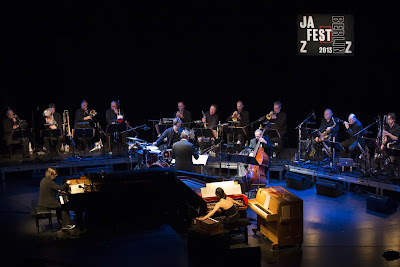 However, and herein lies the strength of the Berlin Jazz Festival, the music escapes again and again from the constraints of the here and now, it establishes a relationship with other eras, to its own history, reminds the listener that it is in a state of constant change, and thus points out to its future. 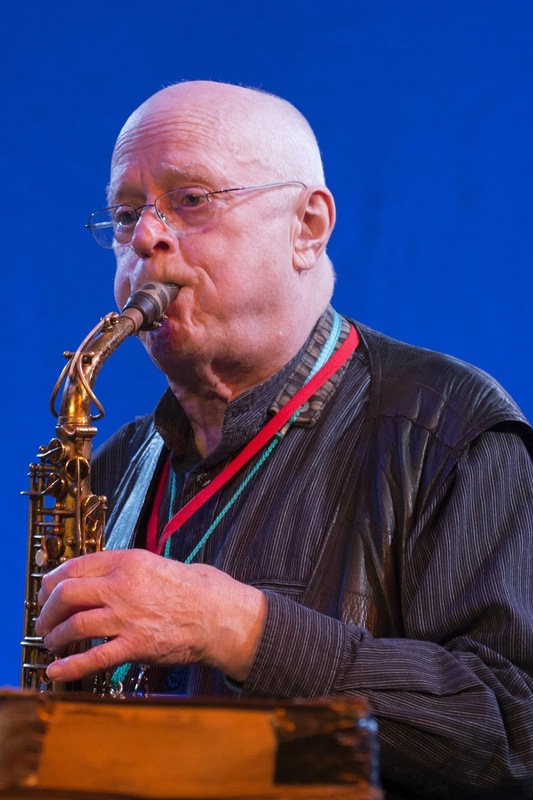 The nightly celebration of the life's work of the saxophonist Ernst- Ludwig Petrovsky in the Academy of Arts could definitely be described in these terms. Petrovsky was in his time one of the most striking figures in jazz from the DDR. He celebrates his 80th birthday in December. Here he was, brightening up the night with three sets, each time with a different quartet, cutting through the layers of his music and for a brief moment, wiping out all evidence, of the passage of time, Or if not, then allowing one at least to forget it. What was true for Petrowsky also applied to the extended quartet of alto saxophonist Ilona Haberkamp, who, once again, was presenting the music of the legendary pianist Jutta Hipp. Hipp had lit up the German jazz scene of the '50s risen like a comet, and then continued to burn in her later life in New York. That sense of time-spans being shortened was also true for a late night show by FOOD, the British saxophonist Iain Ballamy and the Norwegian percussionist Thomas Strønen,in conjunction with the Viennese guitarist Chistian Fennesz. Their laptop - reinforced glimpse into the future of improvised music seemed based on almost classical forms. It even holds true for Jaimeo Brown's Transcendence, linking the freedom of anthemic improvisational music with references to the harmonies of Gospel, the rhythms of hip-hop and samples of spoken blues litanies with different layers of African-American music. The Berlin Jazz Festival seems to put forward the persuasive argument that the new and the old are dialectically intertwined. If they can be simply given permission to co-exist and interact, then there is no need to fret and worry about whether jazz has a future. first and foremost THANK YOU . Your insight of the veteran player and the youthful skilled player was on point. I enjoy the Christian Scott energy, they are sensational and my friend (I would let him sit in as a very young teenager ,) Jaimeo Brown . it was family reunion for me . To reconnect with Pharaoh Sanders ,Fred Wesley and Terrance Blanchard , it was indeed a homecoming . Thank you once again. if I can be of support for you please simply contact me I am at your service as I serve the music. i apologize i did not catch this ealier . it was brought to my attention by folks looking for information about me. thank you for your kind words , they mean a lot to me.